So, it looks like we are stuck here for today. 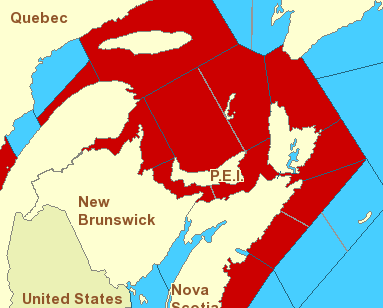 The marine forecast does not look very good for anywhere in the Maritimes! Tomorrow doesn’t look that much better except that the wind is going to switch to the north which is apparently good for us. We will see! Last night, Mike, Nadine, Marike, Nevé, Marcel and Mijanou arrived from Fort Louisburg. They were headed towards Halifax and stopped in for supper. They brought pizza and I made a salad out of the last of the lettuce. They are returning to Alberta on Thursday but it was nice to see them one last time. Unfortunately, I didn’t get a chance to redeem myself in cards with the girls! Here’s a picture of the whole gang! We will probably do boat chores today – cleaning and shopping. We will most likely get our exercise by going up and down the giant hill in order to get to the grocery store! I can’t imagine driving here in the winter! Tomorrow, weather permitting, we will get to Ballantyne’s Cove and then on Thursday, we should be back at the Woods Island ferry terminal. We may as well get ourselves a lobster roll!